Battery - 1 Lipos included! 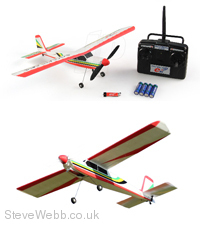 Miniature version of the world famous Seagull Boomerang trainer 2.4GHz radio controlled aeroplane. This is a great model that will reward you with many hours of fun and frolics. The eRC Boomerang is made from robust EPS foam and incorporates a quick release main wing that can be removed in seconds if needed. This can be important with any model when trying to smuggle it into the back of the car ready for the annual family holiday trip. … So I’ve been told! The Boomerang comes ready to fly so just a quick charge up is needed and you are ready. Taking off from the ground (ROG) is no problem or if you are in a park and flying from grass then only a little hand launch is all you need. The climb rate is good and this bird won’t take long to gain altitude and because of its high visibility colour scheme it will stand out well in most sky backgrounds because the colour scheme was designed for the Seagull i.c. Boomerang. The flying nature of the Boomerang is what you would expect from a trainer type model so she flies smooth and precise at low or high speed but if you want a bit of excitement then throw the sticks around and she will come to life and be very agile. Flight times are around 10 minutes and batteries can be changed in seconds because of the unique twin magnetic mounting system used on the Boomerang. Should you have any mishaps then be assured that a comprehensive parts backup is available. RTF version includes everything you need to fly right out of the box!